The end of February brings the first anniversary of two very successful bike-sharing systems. One in Europe and the other in North America. Both have exceeded usage expectations of their respective city governments and are planning to grow. It was an immediate success in the heavily auto congested Colonia Condesa, Juárez, and Cuauhtémoc areas of the Federal District. Within a few months the coverage area was expanded to include parts of the Historical Center of the city. 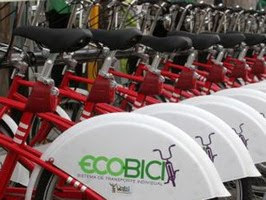 In the first year ECOBICI was used 1.2 million times. There are around 25,000 registered yearly subscribers to the Clear Channel system of 1,200 bikes and 90 stations. These subscribers use the bikes an average of 9,000 times daily with a median trip of around 20 minutes. According to Milenio.com, at the First Anniversary Celebration, Mayor Ebrard and Clear Channel announced that the service will add 1,700 more bikes and 110 more stations before the end of 2011. 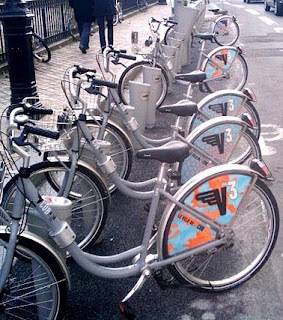 It also plans to have a total of 4,000 bikes and 275 stations by the end of 2012. Like the wines of this region, it was a good year for the experiment to make buses, trams, and bikes seamlessly interconnected in and around Bordeaux. With 1,545 bikes of VCUB (Vélos for the Community of Urban Bordeaux) being used around 5,000 times a day, over 1.6 million trips have been taken this first year. Another measure of success is that 75% of subscribers have signed up for the full transit option, not just the bikes. Interestingly, in a survey 50% of 13,000 subscribers indicated they owned their own bike. According to SudOuest, during the beginning of the service, bike store operators were not enthusiastic of the program, but now have seen an increase in demand for new bikes since there are more people accustomed to riding in the city. The operating company, Keolis, also operates the region's buses and trams. What does a bike-sharing trip look like? Well there are many home videos out there showing the first bike-sharing ride in Paris, Denver, or Montréal. There are educational videos showing safety while bike-sharing. There are also videos of dare-devil rodeo stunts on these transportation workhorses. However, one of the most fascinating is this amazing animation video from Dr. Martin Austwick at the Centre for Advanced Spatial Analysis - University College London (CASA). His video shows what thousands of bike-sharing trips look like in one day when the London Tube was on strike. Folks bailed the rail and hiked to the bike. This video was made possible by the collaborative work of Oliver O’Brien (his blog at Suprageography) also at CASA, who mapped the routes from station to station. In this video, a bike picked up flashes red, then leaves a Barclays Cycle Hire Blue trail as it goes, and flashes yellow when returned. The information to make this video came from Transport of London after one million trips were made on the system. Using this same information of all these bike-sharing trips from July to November in London, interactive “spider maps” of bike movement from dock to dock are now available. With O’Brien’s spectral London Bike Flow Map, each day’s trips from each station can be seen. David Quinn, (QUA, from MIT), created a Trip Frequency Map that shows a value for the amount of bikes that move from one station to another. When data on bike-sharing is made available, it becomes a very good tool in determining the best way to structure services to serve the public with personal mobility. There are more videos on bike-sharing services from around the world on the Bike-sharing Video Pages. There are also more CASA visualizations available on the Bike-sharing Metrics Page. While the Middle East dominates the news this week, bike-sharing is dominating the Middle East. 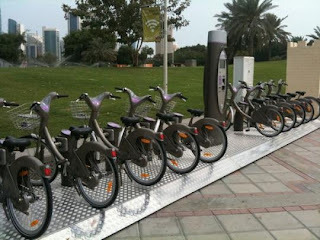 A CycloCity system, Q Bike, in Doha, Qatar has begun operating. The program is a joint effort of the Ministry of Municipality and Urban Planning and q.media Decaux, a subsidiary of JCDecaux. “The idea (with this program) is to eventually make our country bicycle friendly,” the Qatar Cycling Federation President told Gulf Times at the launch ceremony. The ribbon cutting was attended by bicycle legend Eddy Merckx to underscore its importance. The program is starting as a small trial, but is planned to expand throughout Doha and possibly the rest of the country. It is interesting to note that this station, pictured above, seems to be a "drop in place" configuration which would not need to be cut, or trenched, into the street or sidewalks as all other CycloCity programs throughout the world have been. 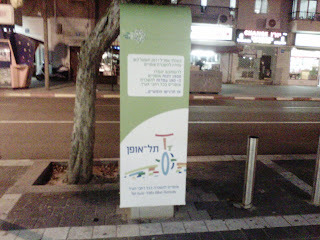 Tel Aviv's TelOfun bike-sharing service is under construction. It is scheduled to begin operation this spring and will start with 750 bikes and 75 stations and expand to 150 stations with 1,500 bikes. There will be an annual subscription fee of 280 shekels with a special 240 shekel price for Tel Aviv residents ($73 and $63 USD respectively). There will also be a weekly price of 60 shekels ($16 USD) and a daily price of 14 shekels ($4 USD), except on Saturdays and religious holidays where there will be a 20 shekel price ($5 USD) for tourists. The usage fees will follow the regular bike-sharing formula of no charge for the first 1/2 hour and then 5 shekels ($1.30 USD) for the next 1/2 hour, etcetera. The bikes, bright green in color, and the stations will be similar to the DB StadtRAD (Call a Bike) system in Hamburg, Germany. Also in the news from Israel this week is the work of two Tel Aviv University professors, Tal Raviv and Michal Tzur who are working on mathematical models to facilitate re-balancing bike-sharing stations in large systems: Static Re-positioning in Bike-sharing Systems. This is a continuation of a concept developed for the Bicing program in Barcelona by Aleix Ruiz de Villa in 2009.